Because no one wants to play bartender all night long. 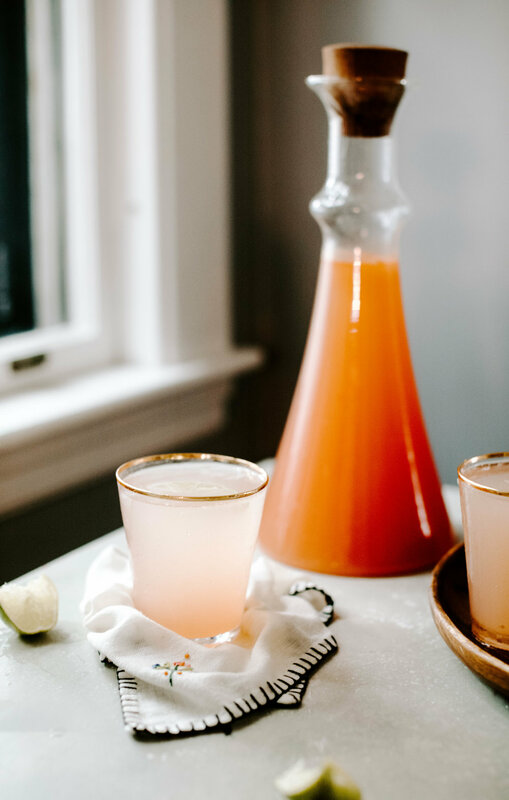 This pitcher recipe has been on repeat all summer long here at the Bravo household. We've brought it to parties, served it to friends at our house, and sipped it solo. There's really no bad time for this yummy and refreshing cocktail. The truth about Palomas. Okay, I want to start off by saying that I am a huge margarita fan. So much so that I can almost always be convinced to have one any time, any where (read: January in Maine). But everything you think you know about the margarita is a lie. What am I talking about?Well, when you think of a Margarita you probably think of a beach in Mexico. However, it's actually NOT the national drink of Mexico (insert shocked face). You know what is? the Paloma. The ingredients don't look much different, and yet they really are not the same. 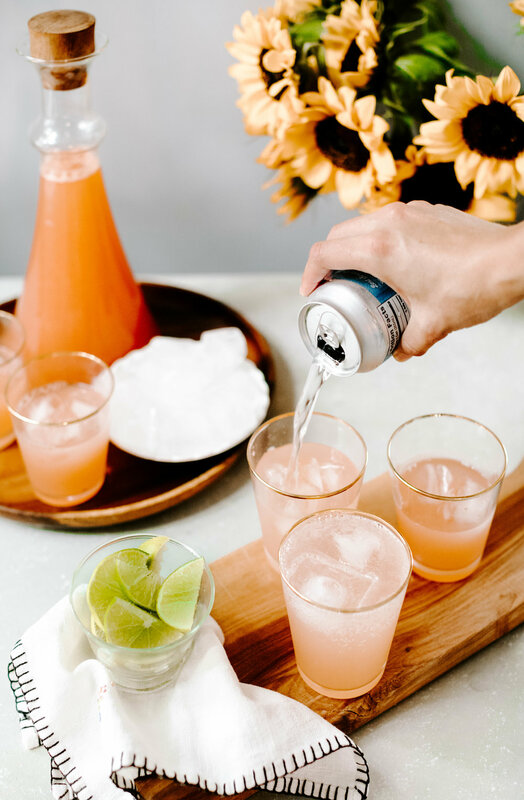 Give the bright Paloma a whirl next time you're in the mood for a refreshing drink to sip beachside. Freshly squeezing the grapefruit is what makes this recipe, hands down. In a pinch I've used the store bought, 100% grapefruit kind and it was a completely different drink (in a bad way). Do yourself a favor and work in the tiny extra effort of squeezing the citrus yourself. That includes the limes!! Sugar. I've only used white sugar for this one because I want the sugar to dissolve well. You could use organic cane sugar (the slightly brown sugar) as long as it's a fine grain. Bitterness. Because the grapefruit is fresh, the bitterness may vary a bit depending on the fruit. You may need to add a touch more sugar to taste to help balance out the bitterness. Just remember you'll be adding club soda to top it off and that will mellow the drink out smidge. Lime. When in doubt, add more lime. The lime really balances this recipe out nicely. If the flavor isn't quite right, try to add more lime first. Tequila. Make sure to use a silver tequila and add less to start. You can always add more, but you cannot take it away. Or, to make this drink virgin, omit the tequila altogether. It'd taste great! Club Soda. I've only ever used the plain, unflavored bubbles for this recipe, but I bet the grapefruit or lime Lacroix would be yummy, too!! Just be careful it doesn't alter the flavor too much. The real national drink of Mexico, the Paloma is the perfectly refreshing summer cocktail. Can be made virgin or "mix your own" by holding off on the addition of tequila. In a large pyrex measuring bowl, mix together the grapefruit juice and lime juice. Stir in the sugar until fully dissolved. Taste and add more if it's very bitter. Add tequila slowly to taste. Store in a pitcher or airtight container in the fridge until time to serve. To serve, pour into prepared glasses 2/3 of the way full. Pour club soda to fill (1/3).